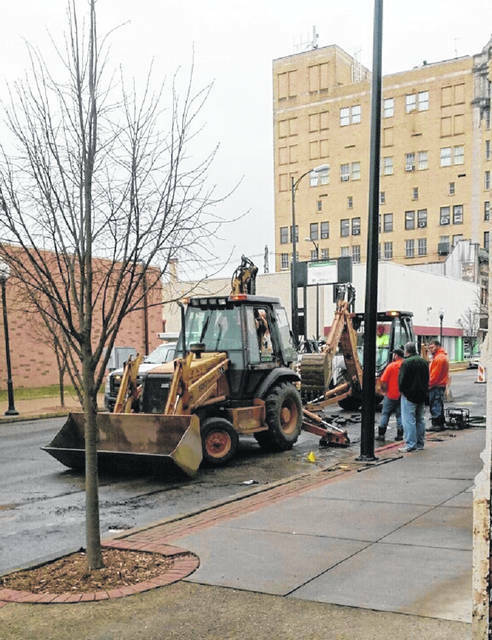 Workers attack the water line break reported about 9 a.m. Tuesday morning on Chillicothe Street. The city of Portsmouth reported two water main breaks early Tuesday morning, one on Chillicothe Street near Frank-n-Stein’s Tavern and the other affecting the strip mall on 11th Street. The latter break actually occurred on 10th Street behind Gatti’s Pizza in the strip mall facing 11th Street said City Manager and Portsmouth Water Works Director Sam Sutherland. In any case, Sutherland did not seem to think the two breaks signaled a return to the numerous breaks which plagued the city in June of last year and caused repeated boil orders around Portsmouth. Sutherland said the break on Chillicothe St. resulted in about one block of the street being closed off Tuesday morning. He added that portion of the street likely will remain closed until new concrete can be poured. Contrary to some rumors, Sutherland noted the city did not have to break up newly replaced concrete to repair the waterline break. He said the only concrete work done in the area recently was to a nearby alley. Sutherland said the break on Chillicothe St. affected about seven businesses on the street. He pointedly noted it did not affect the nursing home in the neighborhood. Regarding the break on 10th Street, Sutherland said it only affected the strip mall on 11th. An employee who answered the phone at Gatti’s said the pizzeria was never able to open its doors Monday and planned to remain closed until Tuesday. The person said he believed the entire strip mall along 11th was shuttered most of Monday, although about 3:30 he said it appeared some businesses were preparing to reopen. At about 3 p.m. Tuesday, Sutherland said repairs on both water breaks should be completed late in the afternoon. As to the cause of the breaks, Sutherland said he couldn’t give an exact reason. Sutherland did say workers have been continuing to repair the 30-inch water main they have been working on since summer. Both last summer and again Tuesday, Sutherland theorized the work on that main was to blame for the numerous water breaks in June. The work caused a change in the pressure in smaller connected lines, many of which simply, figuratively speaking, popped. The work also stirred up standing water in the lines officials said, causing the repeated boil alerts mentioned earlier. Still, Sutherland said he can’t be sure the mainline work contributed to Tuesday’s problems. Like much the rest of the Midwest, southern Ohio only recently experienced some near record cold temperatures, with thermometers hovering around zero or lower. As everyone knows, just following the cold snap, temperatures increased precipitously in a matter of just a few days. The sudden changes in temperatures may well have contributed to the bursting pipes on Monday, Sutherland said. Sutherland added workers are now about 90 percent finished with replacing the large mainline, previously reported as a $2.9 million effort to repair an aging waterline running from the city reservoir. Sutherland has said previously the project essentially has contractors placing a new line inside the existing one. The next major project is replacement of a pumping station on Sunrise Avenue. On Tuesday, Sutherland did not speculate on when that work might be completed. https://www.portsmouth-dailytimes.com/wp-content/uploads/sites/28/2019/02/web1_imagejpeg_02494.jpgWorkers attack the water line break reported about 9 a.m. Tuesday morning on Chillicothe Street.